A reliable source for Mobile Workbenches information and a resource for accessing leading Mobile Workbenches and suppliers. A work station is useful in an industrial or commercial setting when you need a place to store tools, place equipment, or work on a product. However, a normal workbench is stationary, so you have to place it wherever you have room and go to the place it is located whenever you have something to work on. That’s where a mobile workbench comes in. 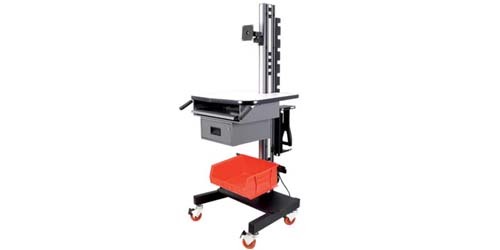 A mobile workbench can be very similar to other workbenches, but it has wheels attached to the bottom so that it can be rolled across a floor. This feature makes the bench easy to move whenever you want. Each of the wheels is fitted with a braking mechanism that can be locked once you have moved the workbench to where you want it so that there is no movement when it is being used. Most manufacturers create large mobile workbenches that are almost identical to a more traditional workbench and just have wheels added for mobility. Other mobile workbenches are much smaller so that they can fit into smaller spaces and easily be maneuvered in tight areas where space is limited. Mobile Workbenches A work station is useful in an industrial or commercial setting when you need a place to store tools, place equipment, or work on a product. However, a normal workbench is stationary, so you have to place it wherever you have room and go to the place it is located whenever you have something to work on. A mobile workbench can be constructed using several different types of material. Smaller ones are sometimes built using heavy duty plastic, making them light but durable. Larger types are usually constructed with stainless steel and have handles for pushing and pulling the unit attached to one or both ends. Accessories like locks for the drawers or integrated electrical outlets for power tools can be added to the final design during the manufacturing process to produce a multi-purpose unit that is convenient in small industrial fabrication shops, auto repair facilities, carpentry workshops, welding plants and other similar workplaces. A small mobile workbench can even be useful in a residential garage for the occasional handy man or hobbyist.